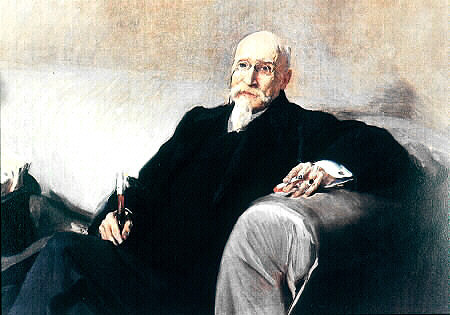 Engineer, mathematician and author of melodramas Spanish born in Madrid in 1832 and died in the same city in 1916. His father was doctor and shortly after birth Echegaray, moved to Murcia for professional reasons. In this city he/she attended high school, which ended at the age of fourteen. During these early studies showed great love for literature and mathematics. He/She decided to follow the career of civil engineer, which was prepared for a year in the same Murcia. In August 1848 he/she moved, together with his father, to Madrid. It arose to roads engineers special school entrance exams, approving them with the number one. He/She made a brilliant career, starting its abundant scientific production in 1853 with an article about the continuous movement in public works magazine. He finished the race at twenty, was appointed in 1853 second engineer of the District of Granada, with 2,250 pesetas from salary. In 1854 he/she moved to Granada, where the Chief Engineer agreed allocation of Almería. He/She moved to this city, which had to make the trip on horseback, as there was no road, being his work keep the 5.5 km of road that had Almeria to Gador. He/She used this period to read the works of Carl Friedrich Gauss, Joseph-Louis Lagrange and Adrien-Marie Legendre. At the end of 1854 he/she was sent to Madrid, and in 1855, he/she was appointed Professor of the school of civil engineers, where he/she explained descriptive geometry, Stonecutting, differential calculus, rational, hydraulic mechanics and applied mechanics. Thereafter, his hobby to the theatre and politics led him to write numerous and extensive works in both fields. In 1857 he/she married and was considered insufficient their salary of engineer, which would add 1,500 pesetas to explain calculus in school. This led him to open an Academy free of mathematics which was attended by about 60 students. By then, a ministerial order stated the incompatibility between the formal education and private; to not be able to combine both, he/she tried to leave the Corps of engineers but prevented their heads, offering compensation commissions abroad. Already at that time he/she had published his report on the calculus of variations (1858), subject that had been introduced in Spain by Benito tricks in 1772. In 1860 he/she was sent to study the drilling rig was used in the construction of the tunnel in the Alps. He/She took the trip to Paris, Strasbourg, Basel and Turin. When it came to the works of the tunnel, they forbade him take notes or make drawings of machinery, but his photographic memory allowed him to play the same night at hotel details of machine. Returning to Spain, in 1862, reproduced in the journal of public works a report with details of the drilling rig of the mount Cenis. The same year, was sent to London with the engineer Leopoldo Brookman who worked for José de Salamanca and Mayol, Marquess of Salamanca. He/She projected a submarine railway that would unite France and England under the English channel, which was presented to Napoleón III. The project was greeted with indifference and forgotten. In 1865 he/she published two collections of problems, problems of flat geometry and analytic geometry problems. The following year, in recognition of his scientific merits, it was admitted by the Academy of exact, physical and natural sciences of Madrid. His admission speech, which dealt with the history of pure mathematics in our Spain, led to several protests and even hard answers. Over time, he/she himself would recognize as risky trials outlined in his speech. The following year he/she published introduction to the geometry of the upper, in summarizing the main theories which constituted geometry above and especially the geometry of Michel Chasles. The same year he/she published the modern theories of physics, dealing with the material forces unit. In 1868, he/she made perhaps the first written statement of the theory of determinants, in his report on the theory of determinants, and also published an elementary treatise of thermodynamics. Its activity during these years, given the number of publications, as well as his speeches at the Academy, their participation in politics and in the literature, is intense. He contributed to the revolution of September 1868 and became Finance Minister in 1874. In 1896 he/she earned a Chair in the Academy of language and received the Nobel Prize for his theatrical work in 1904. It seems that honours and awards calmed down their Republicans heartburn, since in 1905 he/she consented to be Senator for life, Minister of finance and President of the Council of public instruction. Until the year 1915 he/she held a Chair of mathematical physics at the Central University of Madrid. It should be noted that, of the most significant qualities of José Echegaray as a scientist, one was the of have exhibited for the first time in Spain several results and mathematical theories that began to be known in European universities; another, the be a good teacher and know to disclose easily complicated scientific issues. As Tullio Levi-Civita said: "despite not being a researcher, Echegaray gives such seal of originality to the exhibition, knows to simplify problems, thereby that I recommend to my students the study of its lectures and I learn a lot from them". ECHEGARAY EIZAGUIRRE, José: "of continuous movement". Journal of public works, 4 (1853), pp. 43-45, 96-98.ECHEGARAY EIZAGUIRRE, José: "Calculus of variations". Public works magazine. Madrid, 1858. This is the text of the first lessons given on this subject in a Spanish Centre of higher education.ECHEGARAY EIZAGUIRRE, José: Geometry problems. Madrid: T. Fortanet, EIZAGUIRRE, José 1865.ECHEGARAY: problems of analytic geometry. Madrid: F. García Martínez, 1865.ECHEGARAY EIZAGUIRRE, José: modern theories of physics. Madrid: Roig, EIZAGUIRRE, José 1867.ECHEGARAY: report on the theory of determinants. Madrid: Roig, EIZAGUIRRE, José 1868.ECHEGARAY: introduction to higher geometry. Madrid: Eusebio Aguado, EIZAGUIRRE, José 1867.ECHEGARAY: mathematical theory of light. Madrid: Widow of Aguado and son, 1871.ECHEGARAY EIZAGUIRRE, José: examination of several submarines compared with "pear". Madrid: José M. Ducazcal, 1891.ECHEGARAY EIZAGUIRRE, José: resolution of equations, and Galois theory. Madrid: Sons of j. a. García, 1897. This long text, collection of lectures given at the Ateneo de Madrid, attempts to clarify and simplify the theory of Galois, then newly accepted by the Paris Academy of Sciences. Given the difficulties of the theory, the attempt was in that, but with the merit of exposing and reporting of a recent and complicated discovery. Congress International of railways, trams and electricity held in Paris in 1900. Inauguration of the academic discourse. Madrid: Children of J.A. García, 1901.ECHEGARAY EIZAGUIRRE, José: Science and criticism. Madrid: Colonial, 1905. Observations and theories about chemical affinities.ECHEGARAY EIZAGUIRRE, José: The electric power. Madrid: Antonio March, 1905. Lectures on nonassociative, 3 vols. Madrid: Gaceta de Madrid, 1906-1910.ECHEGARAY EIZAGUIRRE, José: history of pure mathematics in our Spain. Madrid: Academy of Sciences, 1866. GARMA PONS, Santiago: "the first exhibition of the theory of Galois in Spain". Llull, 2 (1979), pp. 7-14.REVILLA, Manuel of the: D. José Echegaray, works. Madrid: Ateneo scientific, literary and artistic, 1883. pp. 117-127.sanchez PÉREZ, José Augusto: "Echegaray, biographical features". Mathematical Revista Hispano-Americana, 7 (1932), pp. 49-58 is an objective article on the biography but not analyzing the scientific literature.VERNET GINÉS, Juan: History of science in Spain. Madrid: Instituto of Spain, 1975.